Triangle Color review | What Hi-Fi? 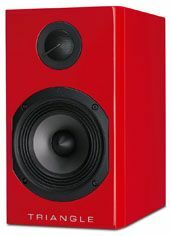 It seems a little odd to us to call a range of speakers ‘Color’, yet only make them in one finish that isn’t black or white. Still, that glossy red finish is rather dashing, isn’t it? There is a yellow version on the way, too. Besides, details like the finish pale into relative insignificance when you hear the sound that comes out of these little boxes. It’s seriously, seriously good. We’re not joking when we call the Triangle Colors ‘little’ – at 29cm tall and 16.5cm wide, they make something like the similarly priced KEF Q300s look relatively bulky. And what they lack in girth they more than make up for in energy. They attack James Blake’s The Wilhelm Scream with a force that’s completely, utterly impossible to ignore. The way the electro-bass beats hit with such precision is breathtaking, and they end just as suddenly, yet there’s nothing analytical here; it just sounds right. The Colors don’t sound like particularly small speakers, either. A head-to-head with something bigger will prove that they can be beaten for bass extension, but listen to them in isolation and you’re unlikely to feel deprived in the depth department. What’s impressive is how broad the soundstage is. Blake’s layered vocal tracks each occupy their own area, yet they adhere perfectly. Switch to something a little less clean, like Regina Spektor’s lovely Live in London and the Colors use their exemplary detail recovery and dynamic nous to produce a beautiful, delicate and dramatic rendition. The only slight flaw is that they do let a tinge of hardness through from raw pieces – but even so, the performance is delightful. On top of all that sonic quality, the Colors benefit from excellent build and great flexibility over positioning. They’re at their most bassy when positioned next to a back wall, and most find their sweet spot about 20cm into the room. And boy, is it sweet.